Jan here–Welcome to the new KnitMe home! 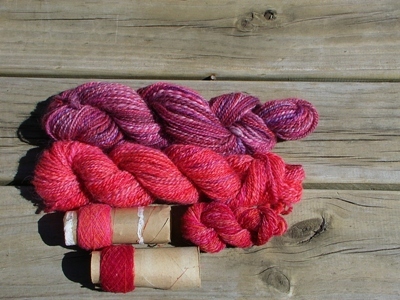 I am going to start my posts off by giving you a galloping run-through of my knitting year. Mostly it was about pushing boundaries and learning new things. This spring I did some…um…educational knitting. I am not a sweater knitter. So I started the year by knitting the wonderful Burnside Vest. There are so many sizes in the directions that it was easy to convert the DK pattern to Lambs Pride worsted in Sandy Heather (right). I promptly learned how much a heavy, softly spun singles in a dense fisherman’s stitch pattern, knitted at the recommended ball band gauge, can grow… and grow. So I reknitted, same yarn (in Golden Oak) and same pattern conversion, but using needles two sizes smaller than the ball band recommendation. The red sweater is my everyday comfortable turtleneck. 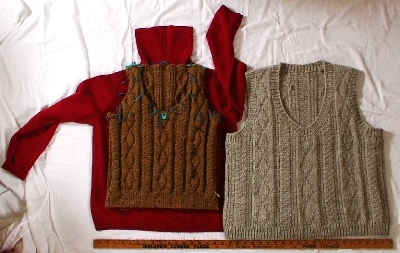 The negative ease gives the vest a pleasant body hugging fit, and the gorgeous gansey pattern pops. After making knitting progress, I pushed my spinning horizons. I worked the exercises in the Fine Spinning Workbook by Liz Lovick. 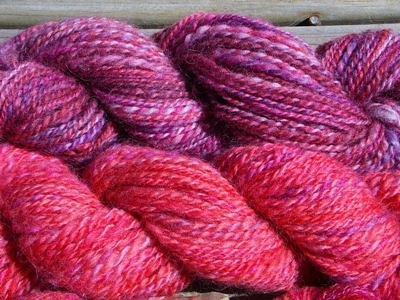 I spun Romney roving dyed by a local indie dyer. 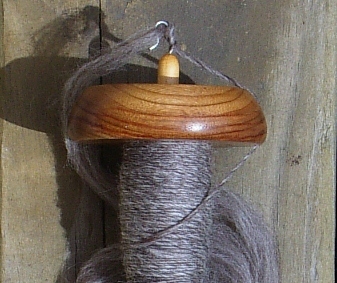 I figured it was high time I learned park & draft, and I spun and plied the singles with some of my beautiful Bosworth spindles. After several sessions of being a tense and overthinking klutz, I relaxed (score a major lesson from the workbook! ), and found that I too, could spin a variety of thicknesses. …which I have not yet mustered the nerve to ply, because she who plies it will have to knit it. Someday. 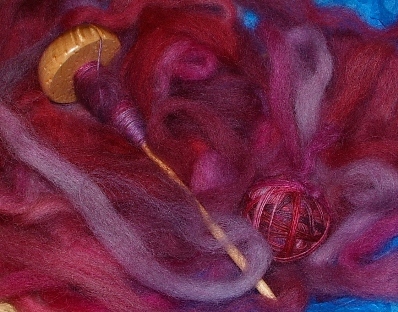 Next I put my new skills to work for the 2011 Tour de Fleece. 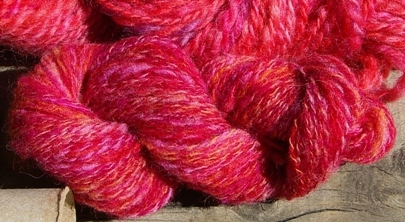 …and a heathered 2-ply yarn from a more thoroughly color-blended section of the roving. The payoff is: A cushy handspun hat and neckscarf. 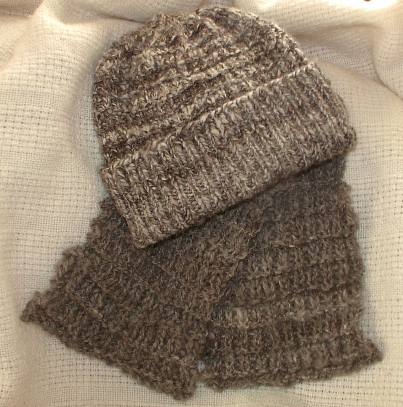 I knitted them in two days in December, using the Design Your Own Hats pattern available from Northern Lace’s Ravelry store. Bring on the cold! I am going to love wearing this. In addition to knitting, I played with fleece. 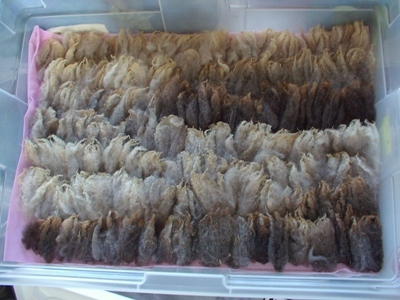 This summer I washed several fleeces of new-to-me sheep breeds. The transformation from more or less grimy outdoor animal coat to shining wool is always amazing, but by far the most ethereal was the Jacob lamb from Lazy Pi Farm. I laid out the intact fleece on the kitchen floor, and kept the locks in strict order as I washed and dried them. 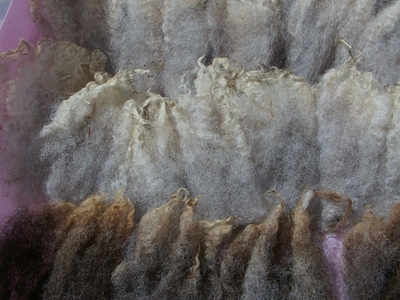 The delicate lamb curls, the subtle shifting colors, and the translucent glow make this fleece a piece of art. It needs no embellishment. Gorgeous work! And lovely, lovely locks!!! I would love to hear more about those breeds! What’s in the box? 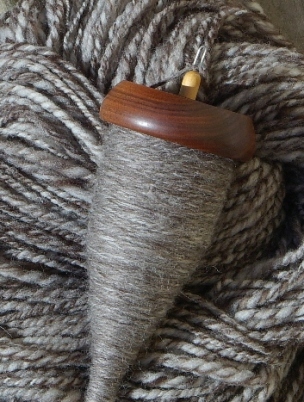 As ever, the spinning is simply gorgeous! 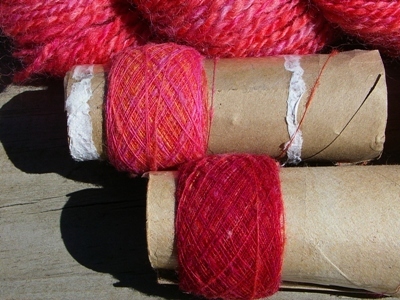 Such yummy wool…is it Shetland? Your spinning is BEAUTIFUL ! and I love your hat !!! 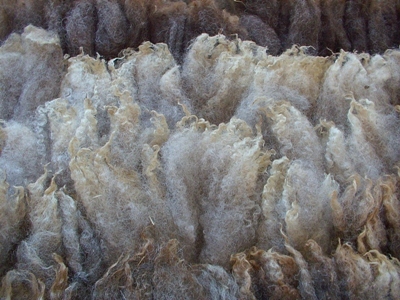 That is the most beautiful Jacob fleece too. Thanks. 🙂 I loved every minute of doing it. Just gorgeous eye candy! Thanks for sharing! I had to revisit your post! It so wonderful, and INSPIRING !!! Thanks! It seems there is always something new to do.